I have a request! Someone actually reads this blog and requested a posting! Does it still count if it was a family member? Aunt Terry (aunt pictured on the Left. Nut Hattie is pictured on Right) -who makes fabulous food by the way-asked me to post about the foods I eat in Haiti and post some pics. I have to be honest though. I am learning to cook Haitian food so I have a cook that comes 3 times a week and the house boy here at the mission house can cook up a mean Haitian meal. FYI-not all these pics are mine. I found some of the pics of food on other sites and "borrowed" them for educational purposes. Breakfast is normal American breakfast stuff. Well pretty much. They try to make spaghetti for breakfast sometimes and I have to veto that. We have eggs, toast, pancakes, crackers, fruit. Lunch is the main meal here and normally eaten around 130 or 2pm. One of my favorite things to fix is lam. 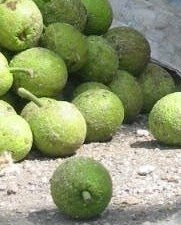 The English word for it is breadfruit. You peel/cu off the tough outer skin and inside is white. you slice it up like french fries and deep fry it. It really tastes like McDonald's french fries. 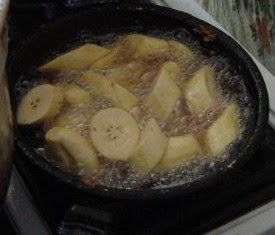 Haitians also boil it and eat it but I am so hooked on the deep-fried variety I haven't tried boiled. We eat this with sandwiches, as a snack. One of my favorite combos is fried peanut butter and jelly with fried lam. Heart attack waiting to happen, but so good! Another side dish you find everywhere in Haiti is Banann. It is a plantain. They boil and fry it. Guess which kind we eat here? How did you know? First you peel the Banann. The cut it into chunks and deep fry it. When it gets soft in the middle and a little crusty on the outside, take it out and smash it flat. You can smash it between 2 plates like here or we use the lid to the mayo jar most of the time. Then put it back in the deep frying oil until it is nice and crispy. 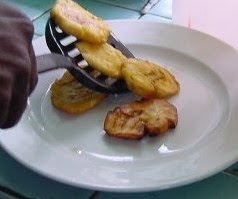 I of course dip it in Ketchup but have never seen a Haitian do this and have gotten some pretty strange looks for doing it. They also put a spicy cole slaw on top if it and eat it that way. Yummy too-if you like spicy food! This picture is another way they fix the banann and sell it on the streets. I am not sure hw they do it. I think cut it into long, thin strips and deep fry it and sprinkle with salt. It's like a plantain chip. Very tasty. Sells for 5 gourde (exchange rate is around 40 gourde to $1 US) a pack. There are probably 15 in a pack. So a very cheap snack. We love them! Now to the staple of Haitian food-Rice and Beans! 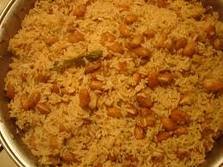 Haitian rice and beans are so good! Especially if they make it spicy with Pima peppers. These peppers are super hot. A little goes a long way. They make a red sauce with oil, a little tomato paste, onions, and Maggi. It moistens the already moist rice and it so good. I have to admit though that rice and beans does get old when you get it 3-4 times a week. Sometimes we have chicken with it. Sometimes lobster. Rarely beef. I buy our beef in Port-au-Prince when I go at the grocery store. The beef here is killed in the morning and hangs in the open air in the market covered in flies so I opt out of that for us. A lot of people eat goat meat with rice and beans too but I am not a fan of goat meat so we don't. Back to the rice. I have made the rice under supervision twice. You put garlic, onions and other fresh spices bought in the market (which by the way are super fresh and super good!) crush them and simmer in oil. Then add the rice and water and let it cook. Of course I am forgetting you fix the beans first as they take a long time to cook. The cook here usually started making lunch around 10 am and it's done about 1 or 130pm. No instant cooking here! And Haitian spaghetti. We couldn't talk about Haitian food and leave out the spaghetti! So they make the noodles the same. But there is very little sauce on it and it is oilier than ours. It's spicy too. And of course has the infamous hotdogs inside. Yep, that's right hot dogs. 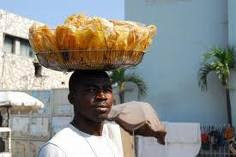 And remember this is a favorite breakfast food in Haiti. Weird! 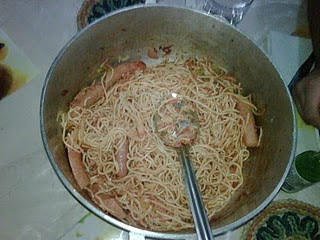 I love the spaghetti (minus hotdogs-Odessa eats hers and mine). 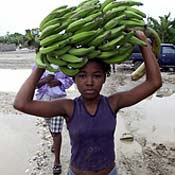 Haiti has so many good fruits. We make fresh sqeezed juice all the time. Odessa is learning how to help make it too. You also get a nice view of the kitchen. And my dirty hair. Ignore that. I am washing it tonight. Seriously. Well...I'm in Haiti-give me a break. It has been raining all week and NO sun to warm the water on the roof to bathe. I jump in and wash off but have been too cold to wash my hair-give me a break-it's long and takes a long time. Too long in cold water. OK back to the juice. tonight we made orange juice and lime juice. The lime is little too tart for me but Odessa loves it. One cool little fruit Haiti has is called Ka-nips. 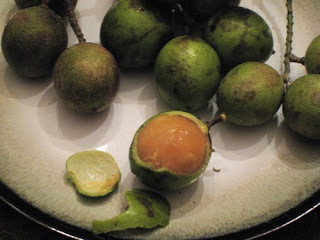 It has a hard rind that when you bite it it pops open and a little, slimy fruit comes out that feels like a grape without the skin on. It's good and has a hard, large seed in the middle. You can buy 30 of them for 5 gourde. Cheap snack when they are in season. Beware though-they stain clothes! I found that out the hard way-Odessa has ruined many an outfit! It is a clear juice that seems harmless but stains clothes black when it dries. I think I could go on and on about the food here. There are so many different things I have never seen in the US. 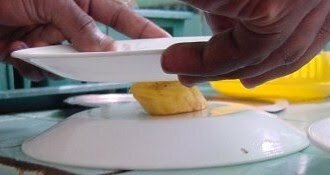 Maybe another installment of Haitian food blog is needed. Thanks for writing all of this! I remember thinking those plaintains would be good with ranch dressing--ha!! Plus, I would have never noticed your hair was dirty. Thinking of you and praying for you often.